Mica, Talc, Calcium Sodium Borosilicate, Phenyl Trimethicone, Ethylhexyl Palmitate, Isononyl Isononanoate, Tridecyl Trimellitate, Magnesium Myristate, Methyl Methacrylate Crosspolymer, Nylon-12, Magnesium Stearate, Silica, Boron Nitride, Polyethylene, Tocopheryl Acetate, Synthetic Fluorphlogopite, Isostearyl Isostearate, Tin Oxide, Caprylyl Glycol, Ethylhexylglycerin, Phenoxyethanol +/- May Contain/Peut Contenir: Titanium Dioxide (CI 77891), Iron Oxides (CI 77491, CI 77492, CI 77499), Yellow 5 Lake (CI 19140), Ultramarines (CI 77007), Manganese Violet (CI 77742), Yellow 6 Lake (CI 15985), Red 6 Lake (CI 15850), Red 7 Lake (CI 15850), Red 40 Lake (CI 16035), Red 27 Lake (CI 45410), Red 33 Lake (CI 17200), Bismuth Oxychloride (CI 77163). Mica, Talc, Synthetic Fluorphlogopite, Calcium Sodium Borosilicate, Magnesium Myristate, Phenyl Trimethicone, Ethylhexyl Palmitate, Isononyl Isononanoate, Tridecyl Trimellitate, Methyl Methacrylate Crosspolymer, Magnesium Stearate, Nylon-12, Silica, Boron Nitride, Polyethylene, Tocopheryl Acetate, Isostearyl Isostearate, Tin Oxide, Caprylyl Glycol, Ethylhexylglycerin, Phenoxyethanol +/- May Contain/Peut Contenir: Titanium Dioxide (CI 77891), Iron Oxides (CI 77491, CI 77492, CI 77499), Yellow 5 Lake (CI 19140), Blue 1 Lake (CI 42090), Ultramarines (CI 77007), Manganese Violet (CI 77742), Chromium Oxide Greens (CI 77288), Red 40 Lake (CI 16035), Bismuth Oxychloride (CI 77163). The colours and the palette itself are beautiful, however, the blend ability just isn't there. As soon as you blend it's like there's nothing there. You have to build the shimmers, but otherwise its perfect. So happy with it. Very nice matte colors - my favorite palette. I love it so much! This palette is my all time favourite. It’s absolutely stunning with such creamy, pigmented colours. This palette is absolutely fabulous! The colours are incredibly bright and pretty blendable which i did not expect. The neutrals are beautiful as everyday glam shades usually are. The ONLY negative thing for me is that shade 'Face' isn't a great brow bone highlight, it looked a little chunky and didn't blend well with the other colours. Overall, love it!! My friend was so happy when she saw the pigment on this definitely worth it! 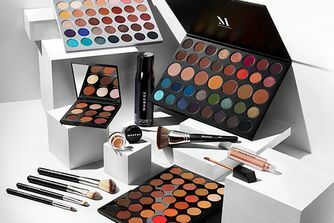 In stock before Morphe UK, bought for my daughter who loved it!! Speedy delivery will definitely use again. Bought this for a friend but I have it myself and it’s so pigmented and the shades are beautiful!! Can’t wait to get this! It’s 8 am now but it’s still out of stock. Still waiting hopefully it will come soon. This pallets is fit for any look. Natural. Rainbow you name it. It is highly pigmented and the size is perfect .DEFINITELY PURCHASE! Fantastic product, my daughter loves the colours and so do I.
It’s a nice palette very colourful still trying to master the pigmentation. This palette is amazing, there’s not much more I can say about it, it’s so pigmented, there are so many options for looks and it’s just amazing. My daughter loves this product. Shes more than happy with it. After driving me potty to buy it her she loves it. My 11 year old daughter loves make up and had her eye on this for a while, we snapped it up as soon as it came back in stock! Worth every penny. Ordered this palette for my daughter. Christmas took several attempts to get it as it was so popular it kept selling out, but when it finally came, OMG my daughter was so excited, the colours are stunning, she’s created some beautiful eye looks, would definitely recommend this palette, also ordered many things from Cult, fantastic service every time, lots of beautiful make up product, keep up the good work Cult Beauty. Versatile palette, can create any look and the shades blend really well! The palette is so bold and great to work with!!! however, as some of the shades are pressed pigments they won’t be the best for beginners as they are slightly harder to work with and need a good base that isn’t too wet to blend well!! some of the shimmers were a little lack luster, however the mattes are amazing and completely make up for it. Omg I love this palette to death the range of colours are gorgeous I am in love. I was spectacle at first but it’s the only palette you need, all the colours to do all looks, you’ll slay every day. This is amazing. It totally lives up to what everyone is saying at first I thought okay it's hyped up so don't get your hopes up but it exceeded my expectations. If you can buy it it is a good purchase. I've been obsessed over sister James forever and I was worried when i got this palate it would be a fake but nope....this palate has so many colours you can create anything from a natural to full on glam to a rainbow. This palette blends so well, very pigmented and reasonable price.Over the moon when I received this. Beautiful and produced by the most benevolent You-tuber, James Charles. This palette is better than expected.If you want to buy a palette that is colourful,no fallout,no patches and very pigmented then this is perfect for you. Worth the price definitely.Must buy. 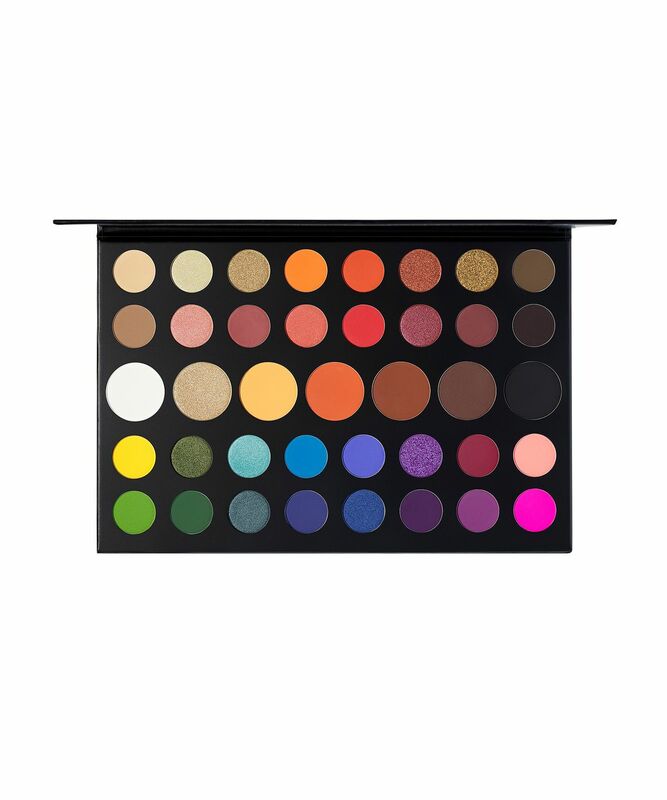 It is such an amazing pallet, I really looked forward to get it. Perfect, the best palette of 2019 yet! I got this as a Christmas present, and today I received my order. When I first used the palette, the pigmentation was INSANE! It's even more gorgeous than on the picture and in James' video. I'm so glad I managed to get my hands on it! 10/10 would recommend! The best palette I own at the moment. (£39 for a palette with 49 shades is AMAZING). It is amazing!!!!! I use the palette in my makeup kit and whenever I use it for bright looks the colours are really pigmented and there is no fallout. I love this palette so much. Honestly better than expected. Would 100% Recommend this palette! 10/10! I got this palette for an early birthday present and I love it. Perfect! I'm so in love. I bought it for my collection and today I received my order. When I saw the palette I was in love, it is more beautiful than I thought. I'm glad I bought it! The formula is so pigmented and blend great. Definitely worth owning it! Love it, amazing palette and worth the wait! The color spectrum is beautiful, very pigmented. I had some problems blending two colors together so keep in mind that the brushes and technique influence the end result with this one, meaning that I don't think it's a beginners best choice. The palette is just what I needed in my collection, color wise, and I want to leave a note that a lot of the colors have a more warm base to it. This palette is physically so so so amazing, would 110% recommend to everyone. It's so beautiful and the colours are so bright, metallics are amazing, blends very well. Best thing I have. Amazing product and speedy delivery my daughter was thrilled. This palette was much wanted, looked great, and was created by someone you want to believe would never put out such a disaster as this. Palette looks beautiful and thats it. Metallics are no shine to it at all, mattes are hard to apply and blend. They don't show up as vibrant as they look in a palette. VERY MUCH disappointed. Beautiful Palette. The shades are all absolutely stunning. 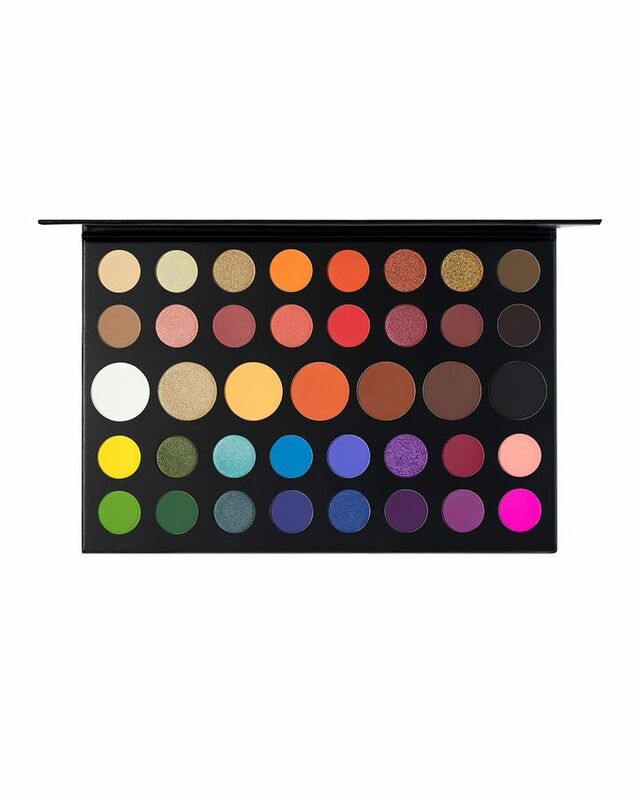 The only thing is that it is fairly similar to the 35B Palette in that there are a few shade similarities but overall in my opinion the James Charles Palette is of a much higher quality. The shades are extremely pigmented, easy to blend and are beautiful. Bought for my daughter for Christmas, she was overjoyed with the product. I have seen her experiment with some lovely colours well worth the money. It’s really good, I love all the colours and they are good for blending out and I love it so much. It’s overhyped. It’s okay but it’s difficult to work with and can be patchy depending on what shades you’re using. I’ve tried primer, concealer and lots of different blending techniques but the palette is inconsistent and overhyped. If you have experience with eyeshadow it’s useable but not for beginners. James Charles is amazing this palette is beautiful. I was really looking forward to this palette and was excited when I finally managed to get one when it was stocked on here, I was so happy. However, I've tried numerous times to use it and every single time I try to blend out the edges, the colour I used before disappears off my eyelid and it turns into a patchy mess. It's impossible to blend and I even tried watching tutorials to see if maybe I was using it wrong but still it just keeps happening and it's basically unusable! I've never experienced this with any other palette before. Perfect colors, love at first sight! Amazing, currently using my friends until it comes back in stock so I can get my own! Great pigmentation, easy to blend once you get the method right. Good amount of product and a fab range of colours. Good for everyday make-up as well outside of the box make-up looks. LOVE LOVE LOVE. This pallet has an amazing variety of colours to choose from and experiment with. I am practicing makeup and this pallet is a lifesaver as it has many colours and looks all in one place. It is also really travel friendly. So highly pigmented, so easy to blend out and an amazing colour selection can do any look with it, overall fab palette really recommend! LOVE this palette! Soooo pigmented and the colours are lovely! It was a birthday present, my friend is obsessed with it. The looks I have seen so far from her using this palette are amazing. Good purchase considering the price, the range and number of eye-shadows. This palatte is unbelievably pigmented, and has a variety of different colours that you can use all over your face, and it is really big so you get your money’s worth! The james charles pallet was amazing .The shadows are so easy to work with .Love it! Wasn't retailers suppose to restock tooo....can't wait for restock!! Very beautiful and strong colours, worth buying. Amazing service and quick delivery. One of my favourite palettes, perfect quality, I love the packaging and size. This pallette is unbelievably hard to get hold of but so worth it. Pigmented and just such beautiful colours. I really love it! This is the best palette I've ever had. I love it. Bought for my daughter, she loves it. It was quite a challenge to get it. The waiting list is a good system. Quick delivery and after having tried several ways, I love it. Thanks and I definitely recommend it! Lovely palette and great service and very quick delivery. My new go to fave! Giving five stars for the palette itself- beautiful quality packaging, pan size is amazing and love the range of colours. Metallics are lovely to use as a highlight as well. It did turn up cracked with the shade Spooky but didn't want to return as it was minimal. and I didn't want to wait any longer to use! Amazing pigments- JC has said there can be an issue with staining but I've found this minimal with a good base below any of the neons. You won't regret buying it! I don’t understand why it’s so hyped. It’s not even that great, I always end up not loving my eye makeup when I use this palette. I used it 3 or 4 times. Used it again today, I was like mehhh, I’ve used better which have been cheaper. Absolutely amazing! I bought this for a gift for my sister as she is a massive James Charles fan! She absolutely loves it. The colours are so pigmented and absolutely stunning in every way. I was super excited when i got this palette just now shipping to Malaysia. This eyeshadow palette is to die for sisters!!! Cant wait to unleash my inner artist!! Honestly I was expecting this to be a complete dud. But nooo I'm now Sister SHOOK! This is by far the best eye shadow pallet I have, it's got so many colours for so many looks, I constantly am picking this up now. It does have natural colours, not as many as I would like, but then it's a artist pallet rather then basic. I'm actually pretty impressed, if you're a new MUA or you want to experiment with colours I would definetely recommend this one! My all time favourite eyeshadow palette! The colours are unbelievably pigmented!! A small bit goes a longgg way! I have created so many different looks with these colours consisting of a neutral everyday look to the extent of a rainbow! Highly highly recommend this palette as soon as you can get your hands on it!!! I was skeptical at first with this palette however it does NOT disappoint. You can do extravagant rainbow eyes, pops or color, or natural. The shadow durability and performance is insane; the only colour which I had a little trouble with is the yellow in this pallet (bee) you need 2 or more coats for optimum pigment. But aside from that yup you’ll slay every day with this pallet. I was blown away by this palette. Definitely recommend! I love it sooooo much going to use it loads! Such a great buy for anyone’s make up collection, it has everything you could possibly need. The only reason that it’s not a 5 star review is that some of the colours are troublesome; Cola, Pinkity Drinkity and Single aren’t as amazing as the rest, and Spooky is decent but not the best black I’ve ever used. This is a palette you could take and use for everything though, with every day shades and everything else in between. Worth the money for You’re Kidding and Rusted alone. It’s perfect for any look you’d want to do, I’m so in love! I bought this for my sister for Christmas and she was over the moon with it. It came very nicely packaged (wrapped in bubble wrap and in a bubble wrap sleeve) and the pallet itself is of amazing quality. Well worth the money! Perfect! Exactly what I hoped for and more! Bought this as a Christmas present for my daughter, she’s a huge James Charles fan so this made her day. She loved, loved, loved it! & the eye makeup looks she’s done all look lovely. Nice & bright colours. Bought this as an extra Xmas present for my daughter she said it’s amazing, she has created many stunning looks already, very lucky to get it in time for Xmas Thank you so much. 13 and 14 year olds were delighted on Christmas morning as they are at the experimental stage. The colours are perfect and the palette is exquisite. I was pleased I had added myself to the wait list as the item sells out so quickly. This palette is SO beautiful, so pigmented, the shadows blend out beautifully, as James has stated multiple times some shadows work differently, and you need to use different techniques to get the best out of them so as long as you use them properly it’s all good I’ve tried every single shade and had no problems. You can create so many looks and I cannot recommend this enough. my new favorite palette. My only issue being that one of the blue shades was a little tricky to blend out but other than that it’s an amazing palette. My stepdaughter was over the moon with this. Love it I’m buying another one. I love thisssssssss, the palette is so pigmented! I haven’t even tried it yet but I'm waiting for it I’m dying to get my hands on it and I already know it will be the best palette ever also I don’t even do makeup so this is a great learning tool. THIS IS THE BEST PALETTE IN THE WHOLE MAKE UP INDUSTRY BY THE BEST MUA. This palette does not work as it should, especially bright colors. I do not know what's wrong with her, but the shadows are awful showered under the eyes, I pick them up carefully on the brush. It seems to me that the only good palette from you is the first one from Jaclyn Hill. It’s exactly what you need! Wow, I can create any look with this! Trust me it's beaut!!! !